Back pain is one of the most common issues that can take you away from your active lifestyle! According to a study, 31 million Americans experience back pain at any given time, and as much as 80% of the population will experience back pain at some point in their life. Lacking in upper back (thoracic spine) mobility can wreak havoc on your back resulting in you becoming another statistic. The low back (lumbar spine) is meant to be a rather stable area of the spine, however through our standard American lifestyle we tend to spend too much time seated in front of the TV, at the computer, behind the wheel, and on our phones. This typically leads to poor posture and tends to put a hunch (hyperkyphosis) in your upper back and a sway (and accompanying anterior pelvic tilt) in the low back. That sustained hunch and counter sway leads to a lack of mobility in the upper back and too much mobility in the low back. Why does this matter to you?? Because that excess mobility in the low back causes instability and weakness that leads to your low back pain. I just used a few words that you may not be completely familiar with. I'm going to start with mobility and briefly touch on stability, but save that for another day! Mobility is defined as the quality or state of being mobile or movable. Great! I gave you a definition that probably didn't help you understand the connection between your low back pain and your upper back mobility, or lack there of. Ultimately what we are seeking to create is ability of the upper back to move freely, as it should. The capacity for movement in the upper back is so much greater than that of the lower back due to the anatomy of the bone structure. The upper back has ample ability to move in flexion (bending forward), extension (bending backwards) and rotation (turning your body left and right). However in our rather sedentary lifestyles we tend not to utilize that ability and ultimately, as the saying goes, if you don't use it, you lose it! I imagine you might be reading this and thinking, "well I have a standing desk, I don't sit all day." 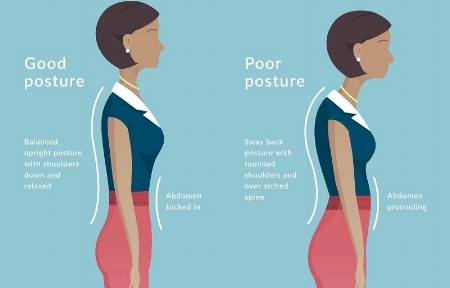 Even standing for long periods of time can still result in a sway of the low back and hunch in the upper back. My point is, we don't do things in moderation, sitting or standing for 6-8+ hours a day is not ideal for our posture and joint structure. So let's get to the point, lets tie this all together. The spine as a whole works to retain a certain amount of motion, so if its lacking in one area, it adapts and increases motion in another area. Most typically when the upper back is lacking in motion the low back attempts to pick up the slack. When that happens we end up with instability and weakness in the low back. This results in increased motion that can irritate the joints and discs of the low back. Through a combination of simple mobility and strengthening exercises you can get the correct amount of mobility in the upper back to help begin to stabilize the low back and decrease its excess motion. By incorporating these simple foam rolling exercises into your daily routine you are getting a jump start in creating ample mobility in the thoracic spine to help rid you of back pain that either just started or has been nagging at you for years!